Since bursting onto the comedy scene back in 2000, comedian John Bishop has gone from strength to strength- Reaching the finals in the long running ‘So you think you’re funny’ television show and winning a whole slew of awards. More recently he won over audiences with his show, ‘Live at the Apollo,’ and appeared on the BBC’s ratings juggernaut Top Gear, where he competed as a star in a reasonably priced car and knocked Tom Cruise off the top of the leader board. (And let’s face it- that can’t do a bloke’s popularity any harm). 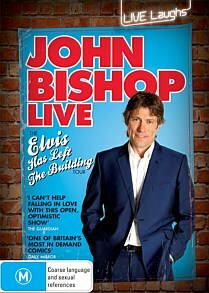 ‘Elvis has left the building’ is Bishop’s first DVD release, and showcases his performance to a packed Empire theatre in Liverpool. After no time at all, it’s clear that Bishop is a one-eyed Liverpudlian football fanatic- before he takes to the stage, we are shown a video of him donning Liverpool FC colours and running onto the pitch at Anfield stadium. Don’t worry if you’re as clueless as I was at this point, because it all makes perfect sense later on. First impressions are that you’re going to have to be someone who knows about football (soccer) and British celebrities to enjoy this show. For Australian viewers at least, that margin might be fairly slim. But stick with it and you will be pleasantly surprised. Through the course of the show, John relates a series of narratives, on a variety of different topics: these range from dealing with teenage boys and their Xboxes, turning 40 and needing to deal with such insidious problems as ‘back fat’ and ear hair, and the less wholesome attractions of the internet. While it is sometimes crude, Bishop’s style of delivery is instantly endearing. He slowly articulates each point, sometimes repeating himself, to add to the overall effect. If you don’t burst out laughing at every joke, you’ll certainly shake your head and smile. Even when a joke falls short of the mark, as they sometimes do, Bishop’s charming persona and optimism are enough to carry him through. Behind the scenes of John’s live show- Some incidental footage of John and the crew as they are setting up at the Empire theatre. Porthcawl Elvis festival documentary- Easily the pick of the special features, this doco describes how a seaside town in Wales becomes a mecca for Elvis impersonators during the festival. It features quite lengthy interviews with the festival organisers and performers, making it worth the watch.